Private Stock™ is used on all materials, ranging from illustration boards to textiles, wood, leather, glass, metals and plastics that include HDPE, PVC, PET, LEXAN and Polycarbonate. Illustrators, Fine artists, T-shirt artists and Custom Painters can use this single system to suit all their needs. 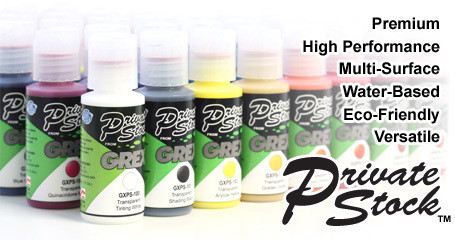 And even Crafters, RC builders and modellers can now enjoy the benefits of a premium airbrush color system. Private Stock™ is water-based, non-toxic and conforms to ASTM D4236 compliance standards. But unlike other water-based paints, it uses proprietary nano-technology that results in minimal dry tip issues and sprays as smooth as solvent-based urethanes to ensure maximum performance and superior control, even with fine nozzle airbrushes. It’s been built from the ground up specifically for airbrush use, but can also be applied with a painters brush.